Demographic transformations don't happen overnight but gradually...tick by tock over the course of years. America's demographics continue to shift and it has major implications on how we do ministry. Here are some of the big shifts you need to be aware of. Changing life spans and age percentages. If you break up ages by 5 year spans starting with youngest and going to the oldest, you would always get a pyramid because there were many more people the age of 5 and below than there were 85 and older. 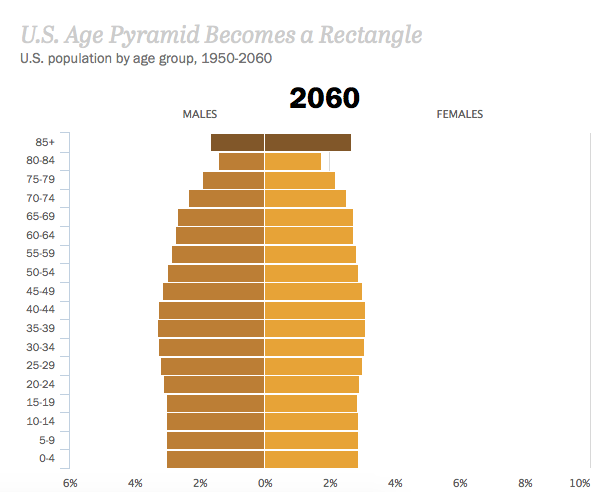 But over the next 45 years, the population will shift from a pyramid to a rectangle as you can see in the chart below. This means by 2060, there will be almost as many Americans over age 85 as under age 5. This is the result of longer life spans and lower birthrates. It’s uncharted territory, not just for Americans, but for all of humanity. The church must be prepared to effectively minister to all generations as this shift continues. Churches that are healthy will have a healthy balance of all generations. Racial diversity. America continues to become multi-colored. In 1960, the population of the United States was 85% white; by 2060, it will be 43% white. It is also being woven by interracial marriages. 1 in 6 of today's marriages are across racial or ethnic lines. 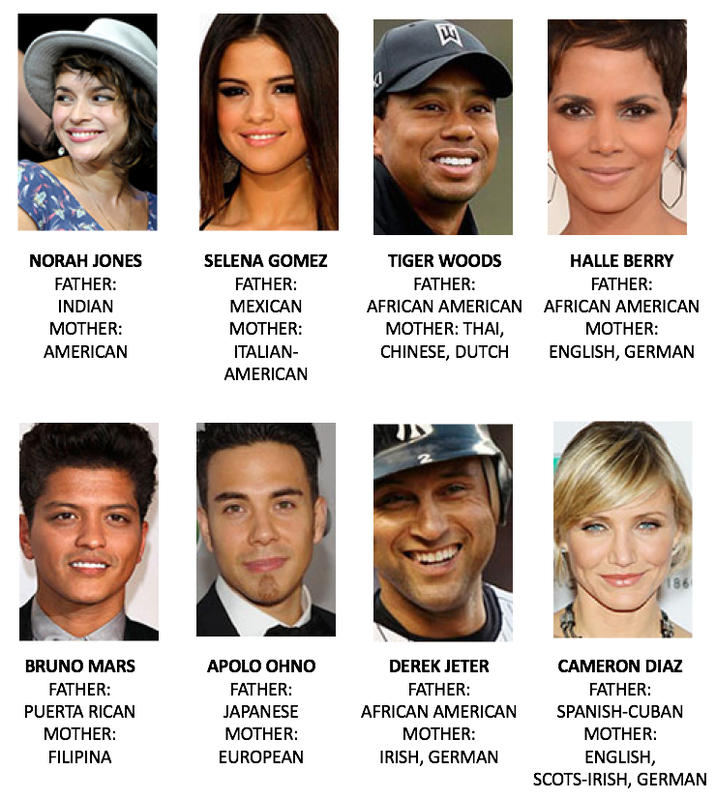 These celebrities are a snapshot of this demographic shift. Dr. Martin Luther King said, "Sunday morning is “the most segregated hour in this nation." While many churches are now more racially diverse, many are not. The churches that will be effective in the future will be diverse churches. Understanding the Generations. Generations tend to be about 20 years in length and are shaped by the historical events people experience at roughly the same stage in their life cycle. As a result, they share what might loosely be called a generational persona, one that’s also influenced by (and often in reaction to) the persona of their parents’ generation. Churches must be ready to minister to the unique needs of each of these generations and know how to bring them together in unity around a common cause or mission.